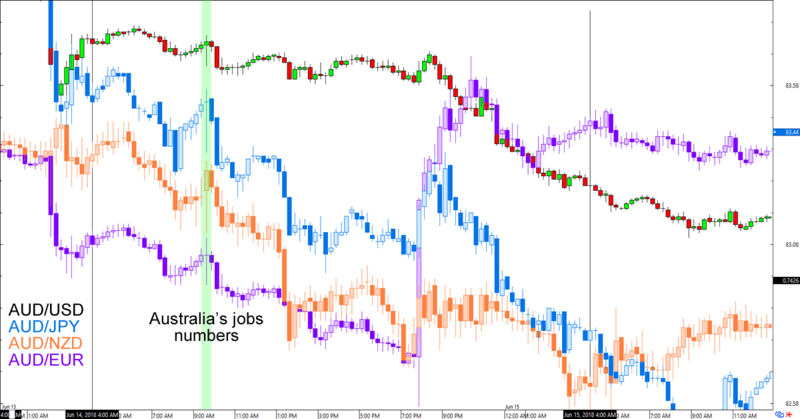 On Thursday at 1:30 am GMT Australia will print its labor market numbers for the month of June. Will we see more disappointment from the sector? Or did Australia actually add more jobs this time around? May’s labor market numbers didn’t exactly inspire confidence last month. While the unemployment rate edged lower from 5.6% to 5.4%, the labor force participation rate also rose from 65.5% to 65.6%. This hinted that the jobless rate decline is more about workers giving up their job hunting instead of increased job opportunities. The headline reading also didn’t have much to show for it, clocking in a net increase of 12,000 when many had expected a 19,000 growth. What’s more, the increase was from 32,600 part-time jobs eclipsing the 20,600 reduction in full-time work! The weak underlying numbers, combined with weaker-than-expected Chinese data dump printed in the same trading session, helped extend the Aussie’s intraweek losses. What are market players expecting this week? Analysts see Australia adding a net 16,500 jobs for the month of June while they expect no changes from the jobless rate AND the labor force participation rate. What do the leading indicators say? Australian Industry Group’s (AIG) performance of manufacturing index (PMI) dipped by 0.1 points to 57.4 in June. This didn’t stop the employment, which saw a 2-point increase as manufacturing employment hits its highest levels since August 2012. Wages also fared better, rising by 0.4 points as some noted difficulty in finding production workers in some locations. Meanwhile, AIG’s performance of services index (PSI) popped up by a solid 4 points to a record high of 63.0 in June. The employment component rose by 4.7 points to 63.8, while skill shortages pushed wages 0.4 points higher for the month. The performance of construction index (PCI) wasn’t as lucky with its 3.4-point decrease to 50.6, the lowest in 17 months. Employment also took a hit as it clocked in its first decline in 14 months while wages also dropped by 6.2 points for the month. Last but not the least is ANZ’s job ads data, which fell by 1.7% after recording a 1.4% increase in May. However, a rep from ANZ maintains that “job ads are still at a level consistent with continued jobs growth,” just at a much lower level than in 2017. Overall the numbers show improvements in the manufacturing and services sector, but not much improvement elsewhere. Can historicals help us with our guesstimates? As you can see below, analysts tend to overestimate June’s numbers about as often as they underestimate them. And while there’s also no obvious trend for employment changes from May, it’s worth noting that May’s net employment change had been downgraded in 9 out of the last 10 years. The jobless rate record isn’t much entertaining either. The only notable probability here is that June’s unemployment rate has inched higher than its May readings in 6 of the last 10 releases. Available leading indicators can support the consensus that jobs growth improved slightly in June. However, if historical trends are any indication, then there’s also a chance that we’ll see a downgrade of May’s job increases. Question is, how will market players react to it? Pay attention to the number of part and full-time jobs created. Remember that full-time jobs are preferable since they mean more stable income and more confidence to make purchases. Oh, and take a look at wages, too! We know that the Reserve Bank of Australia (RBA) is already worried about household debt outpacing household wage growth. A slower wage growth might convince the RBA to keep its easy policies lower for longer. There are no other top-tier reports scheduled around Australia’s labor market release, so unless other market themes dominate in the later trading sessions, it’s likely that the event could set the tone for Aussie’s price action for the rest of the day. There you have it, folks! I hope this little guide will help you manage your risks a bit better this week. Good luck and good trading!